con gli effluvi della zagara dell’amore fraterno. lieve si posa come il silenzio dopo il boato. neppure tra gli scogli aguzzi violati dal tritolo. lieve si stende come il grigio velo della morte. non assopì le idee, non piegò la volontà. il vento ne sparse i petali e il profumo. Inutilmente, ingiustamente dissero a loro: fermatevi. ché il cuore guidava quei passi. Invano, ignobili dissero a loro: tacete. ché il tuono urlava loro in petto. Lottarono e caddero per la lotta. Non dite loro: stolti! softly it settles like silence after the roar. not even amid sharp rocks ravaged by dynamite. softly it unfurls like the grey veil of death. it could not silence ideas, bend the will. the wind scattered the petals and the scent. and their hearts guided their steps. In vain, ignoble they told them: be still. and thunder shook their breasts. They fought and fell in the fight. Say not: fools! their own lives and those of others. 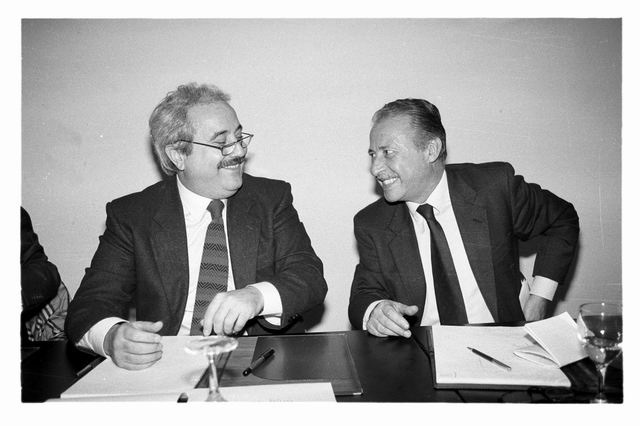 The poem, Dell’amore fraterno, was written as a tribute to two men: Giovanni Falcone and his close friend Paolo Borsellino. Both grew up in the same neighbourhood in Palermo; both men fought the war against the Mafia as prosecuting magistrates. They were both killed in 1992, just a few months from one another. Patrizia Sardisco was born and lives in Monreale. She has a degree in psychology and works at a high school in Palermo. She writes in Italian and Sicilian dialect. Her short stories and poems have appeared on the blogs Tutta colpa della maestra , Apertura a Strappo, La presenza di Erato, Versante Ripido, Carte sensibili, Vibrisse, and Larosainpiù:Patrizia Sardisco was born and lives in Monreale. She has a degree in psychology and works at a high school in Palermo. She writes in Italian and Sicilian dialect.